Chicago is a buzzing city filled with amazing places to go and so many awesome activities. Among all these great places are 7 iconic bars that makes drinking a must thing to do. These bars are synonymous with this windy city. If you haven’t been to any of these spots before, it’s definitely time to check them out. Chicago is so alive during the summer, so check in and don’t miss out on all the fun! The Green Mill in Chicago is iconic. This bar was once a speak-easy for Al Capone and his crew who were known to visit this establishment quite frequently. The very booth they sat in is still in the bar. They chose a particular booth that allowed them to see the front and back exits easily in case they needed a quick escape. This bar is also very known for it’s jazz music and it’s poetry shows. In fact, the Green Mill was the birthplace of slam poetry. If you are looking for a bar filled with history, music and performing arts the Green Mill has it all. Just the history a lone is worth the trip. Chicago is known for it’s sports and it’s sports bars. The Cubby Bear on Addison is located right across the street from Wrigley Field, home of the Cubs. This bar is a well known destination for fans after every Cubs game. Win or lose, Chicago fans always celebrate here after. And now that the Cubs broke the curse and won the World Series in 2016, this bar has become even more popular. 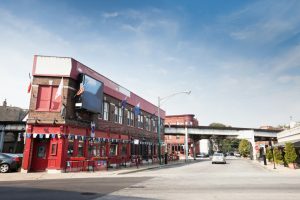 The Cubby Bear offers good food, drinks and even has private events upstairs with great views of Wrigley Field. There are very few liquor stores that serve alcohol, especially in the city of Chicago. However, that is exactly what Maria’s is. It was originally opened in 1939 as Kaplan’s Liquor store. Later, in 1986 it fell under new ownership and people started calling it Maria’s after the owner Maria who was like the ‘mom’ of the neighborhood. In 2010, Maria handed the bar over to her sons who gave it a facelift and officially named it Maria’s. There is nothing more convenient than going to a liquor store, sitting at the bar for a few drinks and then taking a 12 pack of beer home with you. If you have never seen a liquor store and bar combination you may enjoy this quaint little place. Are you looking for a fun bar that sends you straight to an island paradise? Three Dots and a Dash is just that. This iconic Chicago bar is a tropical tiki bar decked out to look like paradise in the city. In morse code, three dots and a dash stands for the letter “V” which during World War II meant victory. At this modern and timeless bar in Chicago, their signature drink is also their name. Three dots and a dash is a drink that was created nearly 70 years ago and consists of rum, allspice, honey and bitters. This island paradise bar in Chicago is also well known for their amazing food such as their Tuna Poke, Kimchi Pork Belly and Thai Fried Chicken. So many people have said this is a hidden gem in the city and a great spot in the dead of winter in Chicago. In 1918, Durkin’s was opened as a bar for older gentleman and also used as a speakeasy. This is one of the oldest, longest running bars in Chicago. Today it is known as one of the best Irish pubs in Chicago. Chicago has a big history with Irish pubs, and during their St. Patty’s Day celebration, they dye the Chicago river green each year. It has been known to be a happening spot with good music, fun and great history. If you want to visit a historical bar while in Chicago, this is a great spot to check out. Maybe, you are looking for that more upscale, glamorous bar in Chicago. The Roof is a modern, upscale establishment some 27 stories above the streets of Chicago. They offer Mediterranean dishes as well as high-end drinks. The views of the skyline are fabulous. They do have a strict dress code so dress casual. You can sip on drinks on the patio or head indoors and warm up near the fireplace. The Roof is known as a great place to enjoy the breathtaking views of the city while drinking your favorite cocktail. The Old Time Ale House is known as one of the best dive bars in Chicago. It has a fun and friendly atmosphere that you are sure to love. The Ale House opened in 1958 and has changed hands over time. In 1971, it caught fire and was moved. It has remained in that location ever since. The entire decor has not been remodel ever. It’s like stepping back into time when you walk through those doors. The walls are covered with many framed-art vintage pieces that are occasionally for sale. They serve a variety of cheap beer but that coupled with the regulars makes this place feel like cheers. If you want an authentic Chicago bar to visit while traveling through Chicago, this is it. It’s a dive bar, but it’s a classic.